In brewing, fermentable sugar is extracted from malted barley using a process known as mashing. What you end up with is a sweet, malty liquid known as wort and a load of useless (or 'spent') grain. I've seen other home brewers use this spent grain in a variety of ways. Apparently it makes great compostable material and can be turned into delicious snacks for your dog. 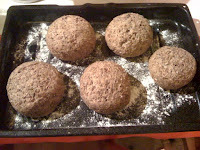 A more traditional use however is to recycle it as a baking ingredient and turn it into a spent grain loaf. Being one that avoids wasting food wherever possible, I thought I'd give it a try. The spent grain I used was mostly Marris Otter pale with some chocolate and crystal. To prepare it, I spread it thinly on a thick-bottomed baking sheet and allowed it to dry out in a very low oven for 2 hours. Some of the spent hops from the same brew also made it into the oven and were crumbled into the grain when dry. To make the loaf, I combined 500g of white flour with 500g wholemeal flour, salt to season, a packet of dried yeast and 500g of the spent grain. Add enough liquid to form a dough and knead for 10 minutes (I used a homebrew lager that was getting a bit too old to drink - adding an extra beery twist). Leave this to prove until double in size then knock back and knead for 5 further minutes. Shape to your preference (I went with basic individual rolls) and bake at 200c until cooked through (45 minutes or so for a loaf). The result is dense, filling and lies somewhere between a pint of beer and a slice of granary toast. 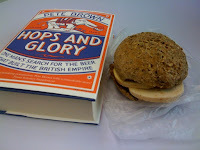 Mine was delicious with left over roast (Quorn) turkey, fruit chutney and Pete Brown's Hops & Glory. @Melissa. It can be a bit hit and miss but is delicious when you get it right. @BrewWales. Seems a bit of a shame to have to go out of your way to get some, especially when I throw so much of the stuff away!